This LED Converter is a voltage-regulated power supply. It features resettable short circuit protection, overload and thermal regulation. It features a universal input voltage of 90-264, 47-63 hz and output of 12VDC. 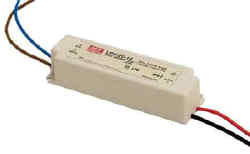 This LED converter allows small DC LED products to be safely used when the only supply voltage available is line voltage AC.